This, my friends, is pistachio oil. My new crush. I have been a fan of another special oil, walnut oil, ever since I was served a beautiful little butter lettuce salad dressed with it in the home of a beloved English professor of mine 20 years ago. I knew I tasted something different, something glorious, in that salad, and when I was told that its secret was walnut oil, I hunted some down (not as obvious a task then as it is now) and have been a devotee ever since. The walnut oil is going to have to cover its ears, though, because pistachio oil is even more divine in its flavor profile and elegance. Pistachios play a starring role in many Lebanese sweet and savory dishes, but the most important part they play is as themselves, in a bowl, on the table. It’s the unadorned toasted pistachio flavor (plus the crunch, and the deep pleasure to be taken in splitting open the shells, then licking your salty fingers) that is so good. 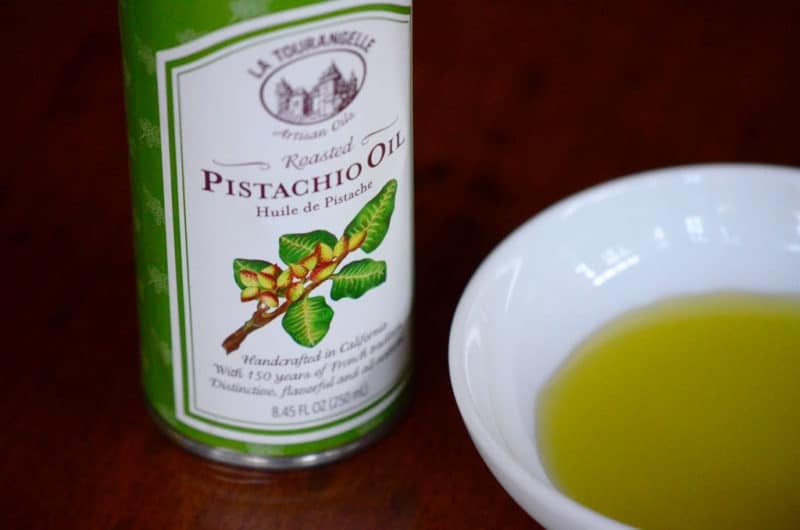 Some way, somehow, the special French milling process used to make La Tourangelle roasted pistachio oil makes for an intensity of pistachio flavor that surpasses even the nut itself. La Tourangelle artisan oils are made in Woodland, California in the French tradition (expeller-pressed). Their variations are super special, including avocado oil, truffle oils, and pumpkin seed oil along with basics like grapeseed, sesame, and coconut oils. Despite their price point and all-dressed-up packaging (which hooked me from the start), La Tourangelle oils are found in specialty shops and grocery stores alike (read: Cost Plus World Market and Kroger, not just Symon’s General Store and Williams-Sonoma). The pistachio oil, like the nuts, is best to me eaten simply, with a dip of good bread. That way you get a feel for its pistachio essence, and you start to form the kind of crush that is such a pleasure to have. The oil is also a wonder when it dresses a salad or a simply steamed or grilled vegetable or fish. 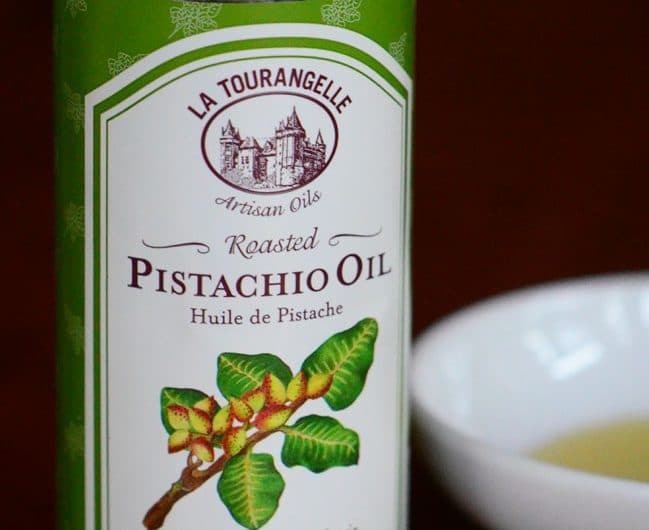 La Tourangelle pistachio oil is not inexpensive, but it keeps well and for a good long time in the refrigerator, after opening. And it doesn’t take much of the oil to communicate pistachio to whatever it is you’re making. In other words, this one is worth every cent. 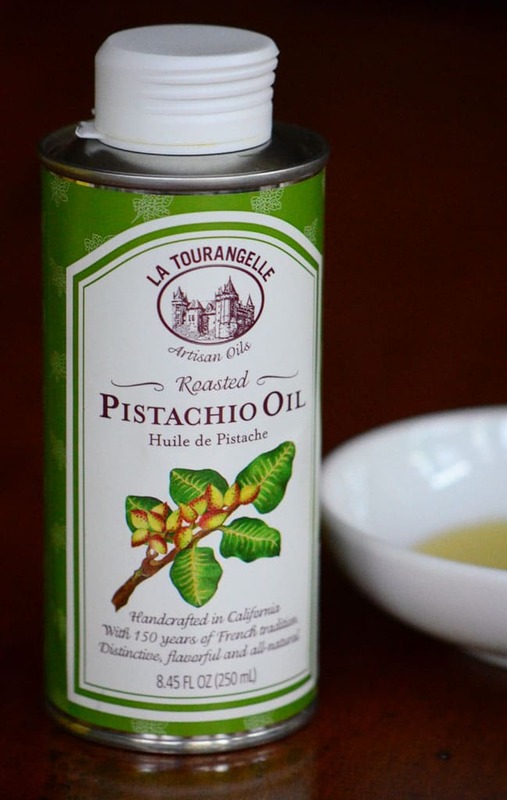 5 Responses to "Ingredient (and a Favorite Thing): La Tourangelle Pistachio Oil"
I just put this on my shopping list–my local, family owned grocery story carries this line! TY for telling us about this. Can’t wait to go to Symon’s and get some. La Tourangelle oils are superb. I haven’t had the pistachio oil for several years and I’m delighted you wrote about it, reminding me it’s time to indulge a bit. Nothing better than a piece of great bread dipped into fresh nut oil. One of life’s little pleasures! I took a cooking class a few years ago and we made steamed broccoli, drizzled it with pistachio oil and added sliced avacado and sea salt. It created the best “salad” ever. Nutricious and delicious – and the smell of the oil as it hit the warm broccoli was heavenly. Thanks for reminding me of this – I have to make it again soon! !